In terms of dietary choices, the seniors of today have been through quite a wild ride. On the older edge of the spectrum, seniors in their 80s and 90s will have been born in the 30s and 40s, before America was permanently changed by the widespread proliferation of fast food and artificial ingredients. Even in the 50s where most 70-somethings were born, the food landscape of America was highly different. It would still be a while until artificial ingredients and fast food became truly ubiquitous in America. Today, we’re having somewhat of an awakening in regard to our food. America has been eating too much junk for far too long, and we’re starting to see the long-term consequences of eating so much processed food. This puts today’s elderly in an interesting position — they went from eating a good amount of “real” food in their youth, to the age of processed food in a time where there was little research that detailed the negative effects of the American diet. Unfortunately, in old age, the body starts to show its weaknesses, and certain foods just aren’t as safe as they once were. If you’re a senior citizen who receives home care service, it’s prudent to be cognizant of what you’re eating and accepting of the fact that your lifetime diet might not be viable now. 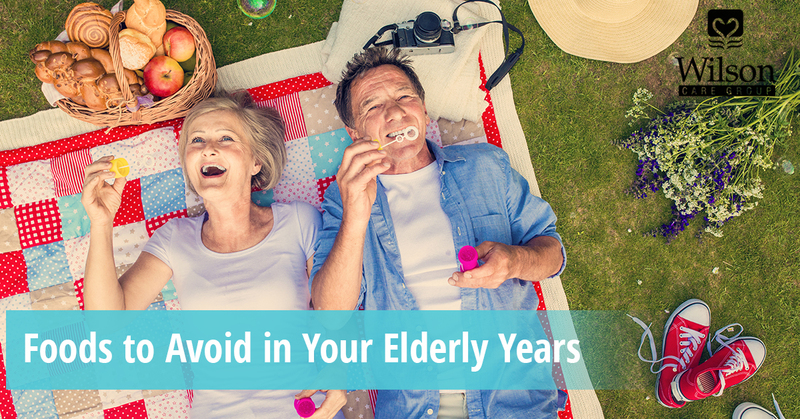 Here are some foods that are better avoided in old age, or, at least, consumed in moderation. It’s hard for anyone to give up cheese, so we won’t say you need to step away from the classic American staples such as good old fashioned cheddar, mozzarella, and pepper jack. But if you’re a cheese aficionado, you might think twice about consuming softer cheeses such as brie, danish blues. These cheeses are heavy in moisture and quick to grow bacteria, which carries a high risk of food poisoning — something that’s far more unpleasant if you’re in an advanced age. If you’re used to an entire lifetime of drinking fine drinks, it might seem a daunting prospect to stop now. And, the truth is, you don’t need to go that far — alcohol is said to be a good preventative measure against heart disease when consumed moderately. But, if you’re one who drinks alcohol on the regular, it’s probably time to cut down. Your tolerance for alcohol weakens as you enter your older years, and it can adversely affect your mental faculties such as your reaction time. Also, it’s not uncommon for the elderly to have a higher count of over-the-counter medications, many of which don’t play well with alcohol. Alcohol also doesn’t do any favors for folks who suffer from ulcers, blood pressure problems, or diabetes. Overall, you’re probably fine having a drink here and there, but regular or frequent alcohol consumption is a habit that’s better left behind. If we’re being honest here, soda has virtually zero redeeming factors save for taste alone, and just about every human being in the world would be better off ditching it. However, older folks are impacted by soda even more than younger people are because of the high sugar count. Soda is essentially liquified sugar. Sugar is dangerous in old age, where people are far more susceptible to diabetes and unhealthy blood sugar levels. Metabolism is also much slower in an older body, meaning that eating junk food and sugar will more easily lead to diabetes, a condition which has plenty of health risks of its own. These two things have become a favorite staple of American food, and unfortunately, they provide almost nothing in the way of health or nutrition. This is something you can afford in younger years where you have an active metabolism and strong muscles to keep you going, but as your body gets increasingly weaker, empty carbs do nothing except for add weight to your body — weight that is much harder to work off due to a slowed metabolism. Are you struggling to adapt to a diet that’s better suited for a post-50 year old lifestyle? You’re not alone. Countless seniors have had certain eating habits throughout their lives that are hard to move on from. There’s nothing wrong with this, but it does mean that you have to take extra care in what you eat now. Luckily, we can help with that at Wilson Care. Out home caregivers and give you personalized aid at home, and helping you to get the food you need each day is just one of the many things we offer. If you’re in Honolulu or any of the surrounding areas, contact us today for quality home care services!